Stephen W. Terrell's (MUSIC) Web Log: ROUNDHOUSE ROUND-UP: NM VOTES. WHAT'S IT TO YOU? Twenty-one states that held presidential primaries and caucuses on Super Tuesday dutifully counted the votes cast and reported their results like the conformists they are. But New Mexico, where the state Democratic Party held a caucus, dared to be different. We’re mavericks here in this Enchanted Land. We’re rebels, freethinkers. We’ll count our votes when and how we feel like it. We won’t cater to CNN or MSNBC. Or the people of New Mexico. We might know who won New Mexico by the end of the week. I attended last month’s Iowa caucuses. Just like in New Mexico, everyone in Iowa seemed amazed at this year’s heavy turnout. Some said the number of people who showed up at Democratic voting sites was double the number who participated in 2004. Of course, Iowa allows independents to take part in the Democratic caucus, and citizens can even change their voter registration right there at the polling place. A real invitation to chaos. So what did they do with this opportunity? Iowans counted up the votes and reported statewide results within an hour or so. Ho hum. No late nights for the good citizens of Iowa. I guess all the farmers had to get up the next morning and slop the chickens and milk the hogs or whatever they do up there. But here in New Mexico, we’re not afraid to stay up past midnight or into the wee hours, or even to take a few days to get the vote. In most states, you just go to your polling place, vote, go home, eat dinner and find out who won by watching TV. But in New Mexico’s Democratic caucus, voting is a gamble. An adventure. Maybe you’ll get a ballot. Maybe not. Maybe you can vote on a scrap of paper. And maybe that vote will actually count. Maybe you’ll be told to drive across town to another polling place. Maybe the guy in line behind you will start screaming. 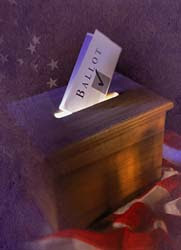 Maybe your ballot will be stored overnight at somebody’s house in Rio Arriba County. So many chances for fun and surprises. In other states, they have polling places scattered all over the place. But in a New Mexico caucus, we get by with as few as possible. Rio Rancho, one of the most populous cities in the state, had just one polling place. Some complained that having all those precincts jammed into one place led to long lines out into the cold and waits of two to three hours if you were determined to help pick a candidate for president. That’s the negative way to look at it. But look at the bright side: It brought everyone together. And what about these reports of people getting angry and frustrated about standing in line, then walking out? Who needs these sunshine patriots anyway? Our founding fathers fought and died for your right to stand in line for hours and wait days for results. So I don’t want to hear any sniveling from ingrates. We should listen to Democratic Party leaders in the state. Sure there were some problems, they readily admit. But isn’t it great we had such a big turnout? Really, who cares what the result was? Details, details. So let the national television pundits make snide little remarks about New Mexico’s way of voting. We do it our way. We dare to be different.